В первой из серии статей "300 лет жизни камчатских вулканов" рассмотрена и проанализирована 350-летняя история эруптивной активности вулкана Молодой Шивелуч - самого северного из действующих вулканических аппаратов на Камчатке, реконструированная на основе исторических документов и сведений, результатов геолого-вулканологических исследований и тефрохронологического датирования с использованием 14С метода. Установлены типы, параметры, геолого-геоморфологический эффект его извержений, их воздействие на окружающую среду, оценены объем и вес изверженных и перемещенных пород, продуктивность вулкана. С 1964 г. размеры возникших вулканических форм, динамика их роста и разрушения, объем изверженных пород определялись с помощью методов фотограмметрии. Часть I. 1650-1964 гг. 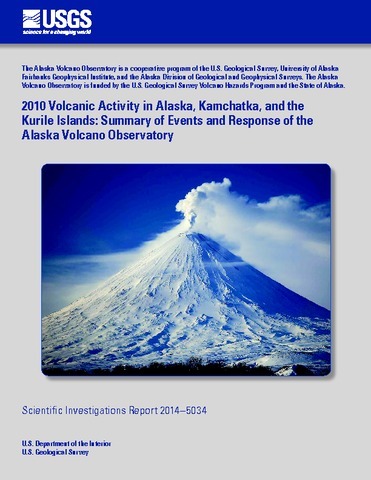 The present paper, the first in the serives "The 300 Years of Kamchatka Volcanoes", examines the 350-year eruptive history of Young Shiveluch Volcano, which is the northernmost of the active volcanic edifices in Kamchatka; the history was reconstructed from historical documents and evidence, results of geological volcanological research and tephrochronologic dating using the 14C method. The results include the types, parameters, geologic-geomorphologic effect of the volcano's eruptions, environmental impact, estimated volume and weight of erupted and displaced material, the volcano's discharge rate. Since 1964 the dimensions of the new volcanic forms, the dynamics of their growth and decay, and the volume of ejecta were found using photogrammetric techniques. Part I. 1650-1964. Горшков Г.С., Соболев В.С. 75 лет со дня рождения А.Н. Заварицкого // Минералогический сборник. 1959. № 13. Klyuchevskoy is one of the most active volcanoes on Earth, erupting lavas at a rate of ∼1 m3/s, equivalent to a 50 km length of mid-ocean ridge. Bezymianny is located 20 km south of the summit vent of Klyuchevskoy and has been erupting silicic andesites since its spectacular avalanche eruption in 1956. Major and trace element concentrations and long-lived radiogenic isotope data suggest that basalts and basaltic andesites from Klyuchevskoy and andesites from Bezymianny were derived by different degrees of partial melting of nearly identical mantle sources. Lavas with higher SiO2 concentrations represent the differentiation products of lower degrees of melting after the mantle was fluxed with a fluid derived almost entirely from subducted altered basaltic crust with little or no sediment contribution. The higher SiO2 concentrations for lavas derived from smaller degree melts suggest that they underwent more fractionation because of the loss of their higher water contents. High Th isotope compositions for all lavas from both volcanoes suggest that a significant time transpired between U addition by a slab-fluid and melting. If the excess 226Ra in the lavas is from the slab-fluid, then long term multistage fluxing before melting is required to maintain these 226Ra excesses. An alternative model attributes the excess Ra to melting caused by upwelling mantle in association with rifting of the central Kamchatka depression. The greater Ra excess for Klyuchevskoi’s basaltic andesites compared to its basalts is consistent with generation of the Ra excesses during decompression melting, and a less than few thousand year time frame of differentiation after melting. The lower Ra excesses for Bezymianny’s andesites compared to the more mafic lavas suggest a time frame of fractionation that is longer than this by several thousand years. 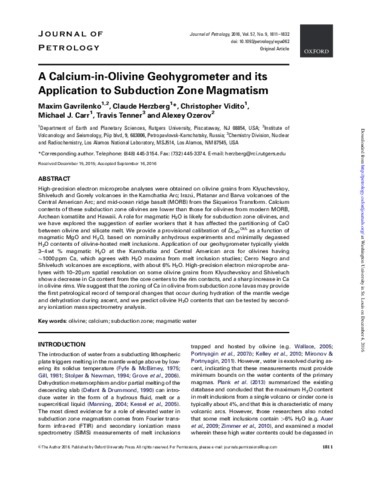 When time since eruption is accounted for, all samples have (210Pb/226Ra) within 2σ analytical error of one, suggesting that significant long-term gas fluxing of 222Rn into or out of both magma systems has not occurred. Lavas from Klyuchevskoy and Bezymianny volcanoes, Kamchatka, appear to show a link between the extent of partial melting in their mantle source region and the subsequent degree of fractionation suffered by the magmas during passage through the crust. This fractionation may have occurred on timescales significantly less than 1000 years if observed 226Ra excesses largely reflect variable residual porosity in the source melting region. Unlike most arc lavas, those with the highest MgO contents and Ba/Th ratios have the lowest 226Ra excess. Forward models suggest that those portions of the source which had undergone the greatest addition of U by fluids from the subducting plate also underwent the greatest extents of partial melting at the highest residual porosity. At Kluchevskoy, a change from eruption of high-MgO to high-Al2O3 basaltic andesites around 1945 is reflected in an increase in size of 226Ra excess which seems to require a simultaneous decrease in residual porosity and suggests a rapid changes in the melting regime. 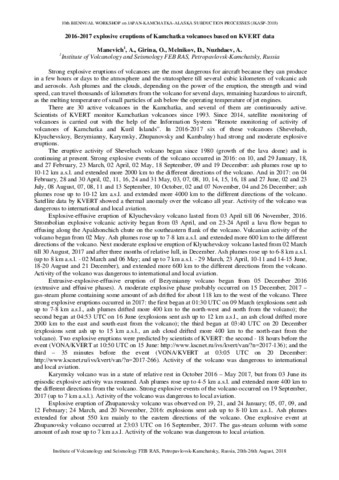 The eruption of andesites at Bezyminanny, simultaneous with the eruption of basaltic andesites at Klyuchevskoy, further suggests that different degree melts produced at differing residual porosity can be formed and extracted from the melt region at the same time. Thus, the melting processes beneath Klyuchevskoy and Bezyminanny are demonstrably complex. 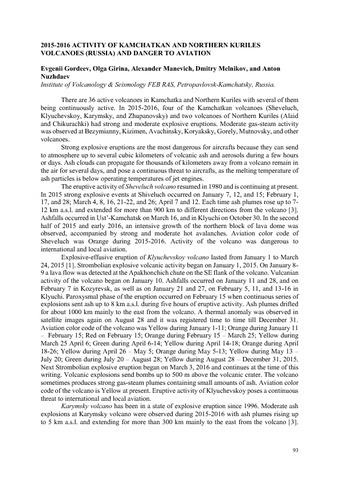 They have clearly been influenced by both fluid addition from the subducting plate and extension and decompression beneath the Central Kamchatka Depression. Finally, the 210Pb data are, with one or two exceptions, in equilibrium with 226Ra, suggesting that there was restricted relative magma-gas movement in this highly productive magmatic system.